In this issue, we interview two researchers: Kay Teschke and Meghan Winters, both of whom will be present to provide expert discussion at the BCEOHRN Loves Bikes event on May 31, 2016! The impact of transportation infrastructure on cycling ridership and injuries. How did you both become interested in this field of research? Kay: I always enjoyed cycling to work and for fun, but saw bicycling in a different light when my daughter was born. I started thinking about cycling safety through my public health / occupational hygiene lens. In North America, we seemed focused on post-crash injury mitigation via personal protective equipment (i.e., helmets). As a mother, I didn’t want my daughter to be in a collision in the first place. In 2004, I started a new program of research, “Cycling in Cities” that focuses on engineering route design instead. Meghan: I have cycled since the start university, finding it was the fastest and cheapest way to get around in those frugal years. Over the years, with friends, family, and now little boys in tow, and a few major bike crashes and injuries, I came to realize the role that city design had in ensuring that people of all ages and abilities are actually able to make choices in how to get around. Our research shows that bike route design makes a huge difference both to safety and to whether people are willing to cycle. 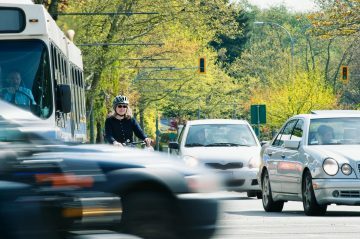 People prefer routes away from car traffic, and these are also the safest routes. We hope that city planners and transportation engineers learn about our research so that they can implement separated bike lanes and other designs that welcome people to this fun and healthy mode of transport. Kay: I first met Meghan when she was a masters student and fellow in a CIHR-funded Strategic Training Program Bridging Public Health, Engineering and Policy research. Her master’s degree was on antibiotic resistance, but she did a couple of side projects on bicycling. I was hoping to find a great student who might be interested in my new area of research and was thrilled that she chose to join me as a doctoral student. Meghan: Kay has provided unweilding support for me – first as an MSc student working in another research area, then as a PhD student, and continuing to this date as I navigate the seas of building an independent research program as an Assistant Professor at SFU. When I’m speaking with students considering graduate degrees they often ask me about my own experience in my PhD. I have the joy of saying I would give my PhD supervisor a 10/10 score – every long step of the way. Kay: The transportation field has so many disciplines involved: engineering, planning, public health, epidemiology, economics, geography, psychology, and on and on. Reaching out across disciplines enriches the research in every way. Meghan: I’d encourage people to reach out and take the time to build relationships. The people I made my first connections with in the early years of my PhD have also progressed in their careers – to other universities, or to leadership positions in municipalities and health authorities. In all of these conversations be sure to do a lot of listening: this is where you’ll learn what evidence gaps they face, and what opportunities might be in the pipeline for your own research. Kay: Meghan has implemented both these tips. She’s a superb networker and her networks are definitely interdisciplinary. She has connections at the start of her career that I have not achieved in my entire career. This has resulted in both enriched research and many opportunities to link research to practice. What’s next for your cycling research? Kay: We are still publishing research from the injury study. A paper about injuries on streetcar and train tracks is under review. 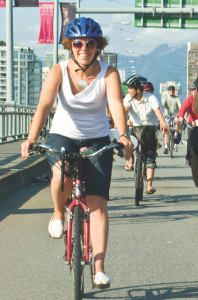 Meghan is leading a study on the new Vancouver public bike share program. Meghan: Bike share will finally launch in 2016! I’m thrilled to be able to finally look at the health and transportation impacts of cycling in our city. This entry was posted in spotlight on May 27, 2016 by kemclean.